This interim budget as expected intends to harvest good votes in the election season and has therefore proposed various beneficial proposals for small taxpayers It proposes various provisions which are beneficial for the owners of property. Let us discuss. The Finance Minister (FM) has proposed to enhance the threshold limit for receipt of rental income without deduction of TDS at source on such income. Presently a lessee is required to deduct tax at source if the annual rent in respect of a property exceeds Rs. 1.80 lakhs in a year. Now the property owners will be able to get the rent without deduction of TDS as long as the rental does not exceed Rs. 2.40 lakhs in a year. 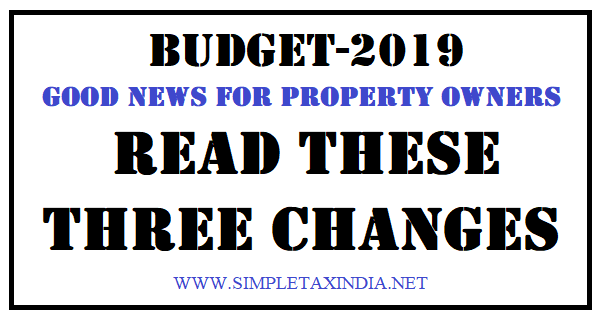 With increased rentals and inflation this revision will help a lots of people have good cash flow, due to receipt of full rent in their hands specially in case their taxable income does cross 5 lakhs. In view of the proposal for full tax rebate for the taxpayers having annual income upto 5 lakhs. The lessee other than HUF and individuals have to deduct tax at source in all such cases where the rental exceed the specified limits. An Individual or HUF also have to deduct tax from rent in case the annual rental exceeds the threshold limit, in case they are engaged in business and their accounts were required to be audited under the income tax laws during the preceding year. Presently if you own and occupy more than one house, you have an option to choose any one of the houses as self occupied and then the rest of the house/s are treated as deemed to have been let out. In respect of such deemed to have been let out house properties, you are required to offer notional rent, which the property might fetch in the market, for taxation even though you have in fact not received any rent on such property. This situation may arise due to various reasons like you having a house in your native place which is not let out and is reserved for you as and when you visit there. Likewise you additional house/s may be used by your other family members for which you do not get any rent. The additional house may or may not be in the same city where you are staying. Such cases have been causing hardship in genuine cases where the owner has to pay tax on the income which is never received. In order to provide relief for such cases the FM has proposed to allow a taxpayer to have two owned houses as self occupied instead of one house being allowed presently. Presently you are allowed to claim interest upto 2 lakhs for home loan in respect of one such self owned and self occupied house, however while proposing the amendment the FM has retained the limit of two lakhs rupees of interest which one can claim either for one self occupied house or in case two houses are opted as self occupied then the same limit shall apply for both such self occupied houses taken together. Presently an Individual or an HUF can claim exemption under Section 54 of the Income Tax Act, if you invest the indexed long term capital gains arising on sale of a residential house for purchase or construction of one house within the time limits prescribed. In order to provide relief to the growing family members in a family who have to buy more properties to accommodate such increased numbers, the FM has proposed to expand the benefit for buying or constructing one or two residential houses provided that such long term capital gains doe not exceed two crores. This option can only be exercised once in a life time and for all the subsequent transactions of sale of residential houses, you will be entitled to claim this exemption only if you make investments in one house. Additionally, one can claim the exemption from long term capital gains on sale of a long term capital asset other than a residential house if the investment is made in one house Section 54F. The option to invest in two houses is not extended for exemption under Section 54F. The interim budget has shown soft corner for property owners and has extended good benefits to them.